As part of our efforts to support and encourage young Australians in study, careers and volunteering in international agricultural research, the Crawford Fund State Committees proudly support our International Agricultural Student Awards. The 2018 recipients of these Awards were announced in May, and we have been sharing the journey of these 22 dynamic Australian tertiary students as they gain international agricultural research experience and expertise. Throughout 2018 and the early part of 2019, the successful Award recipients will travel to their host countries to research and explore their chosen topic areas. You can follow their progress here on the Crawford Fund website and read more about their findings, learnings and any challenges they encounter. To-date we have featured the experiences of University of Western Australia student, Christian Berger; Queensland University of Technology PhD candidate, Thomas Noble; University of Melbourne student, Kimberly Pellosis; Luisa Olmo from the University of Sydney; and most recently Rachael Wood from Charles Sturt University and Ziyang Loh from the University of Melbourne. 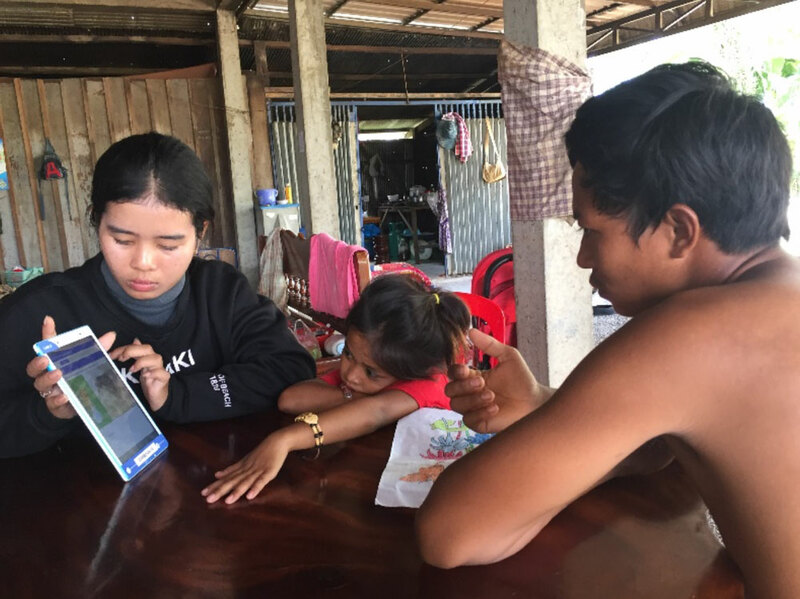 Now, thanks to The Crawford Fund NSW Committee, we deliver this summary of University of Sydney student Lucinda Dunn’s experience with an ACIAR project in Cambodia. 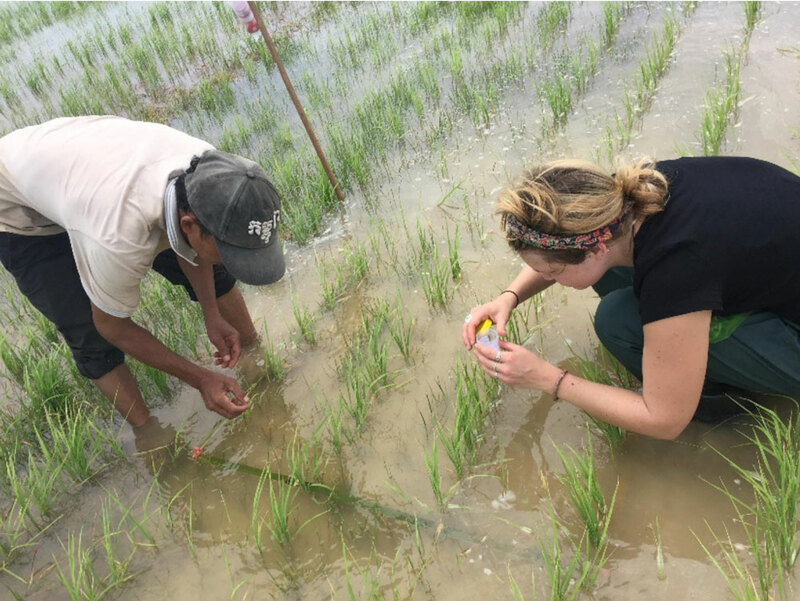 Lucinda Dun recently travelled to Cambodia to investigate the social and ecological constraints of rice pest management in Cambodia with the purpose of developing a sustainable integrated pest management regime for smallholder farmers. Lucinda’s research is part of an ACIAR project titled, Sustainable intensification and diversification in the lowland rice system in Northwest Cambodia. Rice is Cambodia’s most economically important crop and plays an essential role in food security. Of the 3.7 million hectares of cultivated land, 2.7 million hectares (75%) is dedicated to rice production. The majority of rice is produced by smallholder subsistence farmers who typically run low input rainfed production systems as the primary source of food and income. Though the incidence of rice cultivation is high, rice yields in Cambodia are among the lowest in Southeast Asia with pest incidence and ineffective pest control mechanisms having devastating impacts. Currently, the most common method of pest control is broad-spectrum pesticides, and over a 10-year period from 2002 the import of pesticides increased 17-fold in Cambodia. However, farmers are often misusing pesticides and are unaware of any alternative or integrated pest control methods. Furthermore, the information farmers received on how to treat insect infestation is most often from the pesticide seller’s themselves. Thus, a cycle of ineffective pest control measures and lack of unbiased knowledge and advice promotes pest infestation. It is essential to determine an optimal pest strategy with low environmental impact and high sustainability to improve rice production for Cambodian farmers. One such method is integrated pest management (IPM), which includes the use of multiple alternative cultural, physical, biological and chemical techniques and methods to reduce the pest population below the economic injury level. To-date, adoption of IPM strategies has been hindered by the farmers’ lack of knowledge of alternative pest control measures; poor site-specific research into the diversity, abundance, interactions and function of insect pests and predators within the rice agroecosystems in Cambodia; and a lack of understanding of current farmer perceptions, management approaches and requirements, and how these are affecting rice and ecosystem productivity. To ensure successful information dissemination and adoption of IPM methods, research is needed to identify acceptable adoption and translation strategies in the Cambodian context. 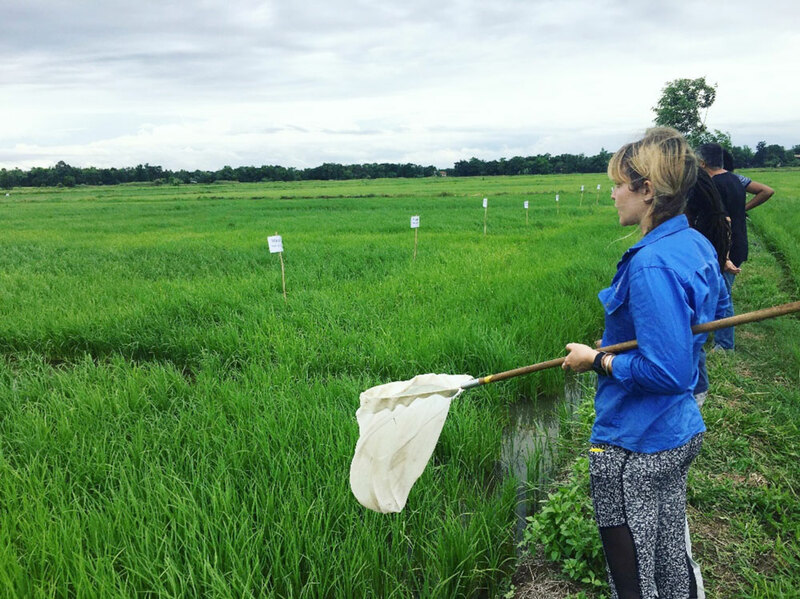 Lucinda’s research involved both identifying the insects in the rice fields and surveying local farmers. “To complement my field data, I wrote and performed farmer surveys which were developed to collect baseline data on the knowledge, attitudes and practices Cambodian farmers have towards rice pests, natural enemies, management practices and their sources of information I uploaded the survey onto Android tablets and had it translated into Khmer. I hope to be able to use this data towards developing a pest identification and management of smartphone application,” said Lucinda. Cambodian University of Battambang Masters students helped Lucinda undertake farmer surveys. From these surveys, it was easy to identify what pests farmers think are most prominent; how many farmers can differentiate pests from beneficial insects; what their opinions are towards beneficial insects; how farmers manage pests; their attitudes towards the use of pesticides; and, their knowledge and attitudes towards alternative pest control practices. The farmers’ responses to some survey questions, particularly when relating it directly back to the results of the field sampling yielded some exciting results, and ultimately more questions. The findings from Lucinda’s project work have highlighted and reaffirmed the many issues of pest control in Cambodia, including no alternative or IPM methods other than chemicals are used, and importantly, farmers are unaware of such alternatives; many farmers identified one of the most beneficial insects in the rice fields to be a pest; and there was a large population of beneficial insects present and while farmers still spray chemicals to control pests, they only seemingly spray once a season. “My findings are interesting as it could lead to a smoother transition of the complete reduction or end to chemical use in conjunction with the education and promotion of beneficial insects, namely ladybeetles and spiders. These are useful findings to begin planning what type of educational and management recommendations are required for the smartphone application,” said Lucinda. “This experience provided by the Crawford Fund was educationally and personally rewarding. I would like to thank the Crawford Fund for providing me with the Student Award which allowed me to fulfil my first season of fieldwork. I would like to acknowledge and give my thanks to the Cambodian farmers and their families for allowing me to work on their farms and taking part in my survey. I would also like to thank one particular family, the Vantha family for being so kind, welcoming us into their homes, sharing their food and thoughts. I would also like to acknowledge the project leaders, Dr Daniel Tan, Dr Bob Martin and Dr Yorn Try, University of Battambang students, all other project employees and researchers and everyone else involved in the ACIAR project CSE/2015/044 for their contribution and support. Thank you to my supervisors, Dr Tanya Latty, Dr Daniel Tan and Dr Mark Stevens,” concluded Lucinda.